* From the airport to Bilbao. 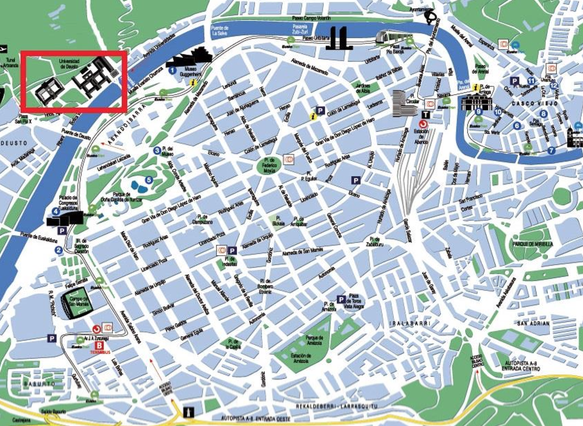 A 20-minute journey through the Artxanda tunnels or along the BI-631 road separate the airport from the centre of Bilbao. The traveller has several options to reach the airport: Bus A3247 BILBAO-Airport: operates every day of the year, with services every 20 minutes in summer, and 30 minutes in winter, connecting with TERMIBUS, the Bilbao bus system and coach terminus. In addition, a private transfer service is available upon request. Bilbao can be reached by railway from France, the Netherlands, Belgium and Germany. Once delegates reach Hendaye, which is the last station, by TGV, (check timetable here) they just have to take a direct bus to Bilbao, which lasts one hour and a half. You can check the but timetables here. By underground: Moyua Station and Deusto Station. Both stations within a ten minutes walk. By bus, which stops at both entrances of the campus. By tram: Guggenheim Station, which stops at the CRAI Library. By bike. The campus is easily reachable by bike. Bike parking is available.